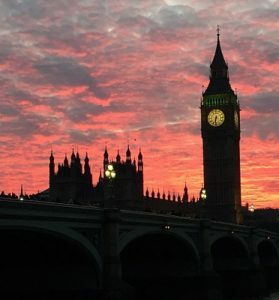 Across the great ocean there’s another gigantic shambles with the maybe vote on Theresa May’s Brexit deal (that no one likes) approaching fast. The politicians are tying themselves in knots while the public appear to be less fazed and are assuming it’ll all shake down somehow. 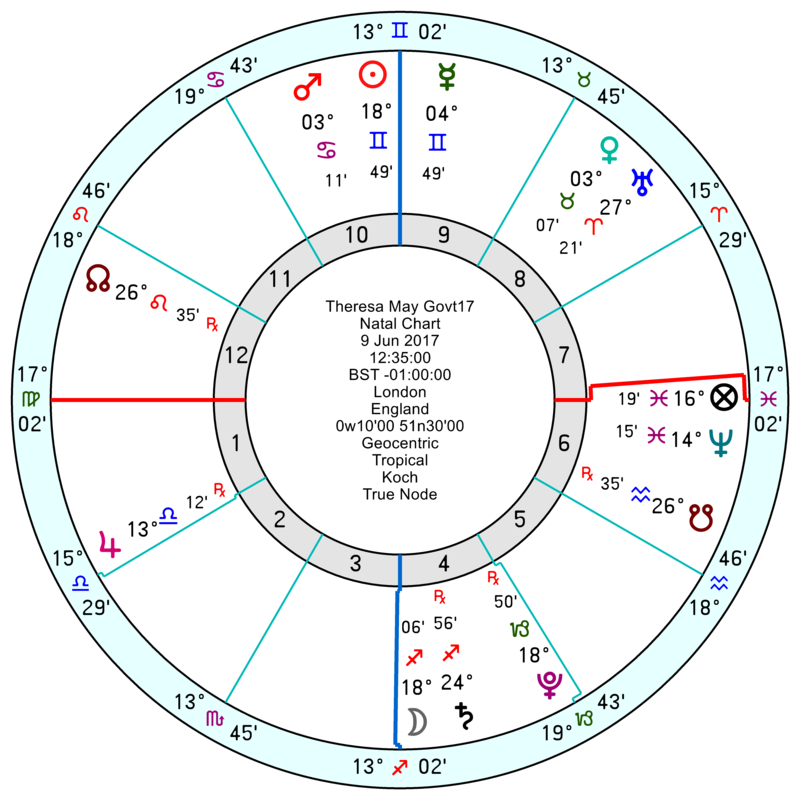 Theresa May’s Term chart, 9 June 2017 12.35 pm London, like Trump’s, has Pluto in the line of fire of this week’s Capricorn Eclipse. Though it’s less clear what effect that will have. 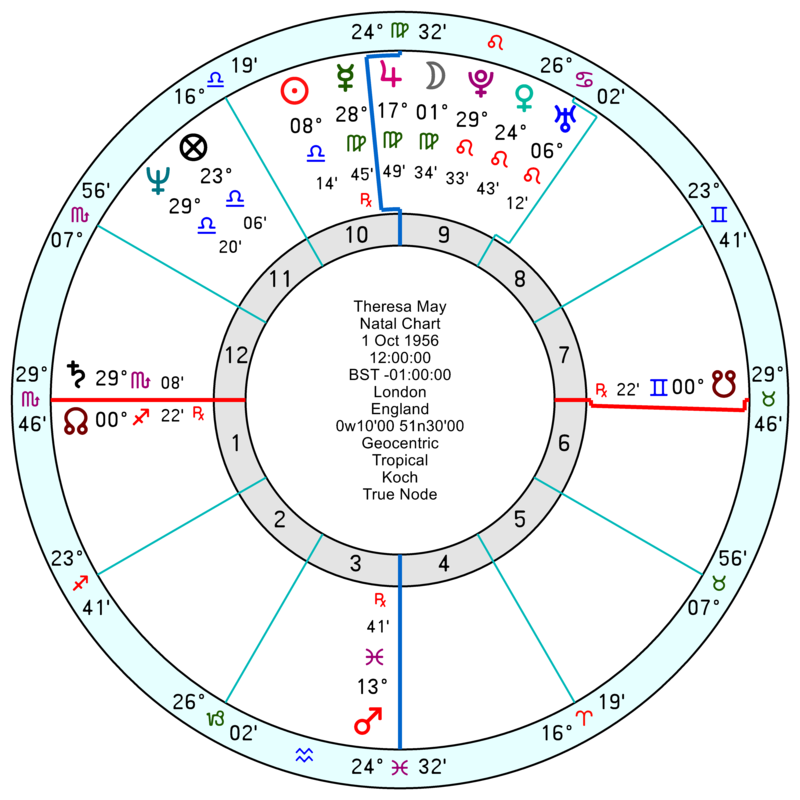 The Term chart is an odd mix of Neptunian waffle, dither and evasion from a Full Moon square Neptune; as well as secretive and control-freaky from Sun inconjunct Pluto. Pluto is in the grandstanding 5th house which also rules children, entertainment and speculation. Perhaps the challenge is to transform the need to hog all the attention and share more, be less possessive. The Term chart looks deflated and defeated from January 15th to 22nd with tr Saturn square Jupiter; and from January 13th has lost the lucky/confident tr Pluto opposition Jupiter/Uranus which has been running since last December. Early February to early March looks upsetting, quarrelsome and insecure. At the March 29 cut-off date tr Saturn will be just over the conjunction to the Term Pluto, for a sense of discouragement and stuckness. 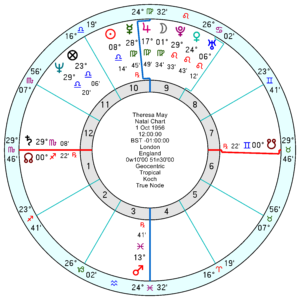 Theresa May’s own personal chart picks up the catastrophic tr Pluto conjunct her Mars/Saturn midpoint from January 14th for a month which Ebertin describes as the rage or fury of destruction, destroyed vitality. Even allowing for his somewhat overly dramatic language, it looks like a major setback. February has an undermining tr Neptune square her Mars/Jupiter midpoint which will dent her enthusiasm; and a quarrelsome, cornered tr Pluto conjunct her Mars/Node. If anything March is worse. From March 31st to late May, she has tr Pluto square her Jupiter/Saturn midpoint which usually accompanies losses in career or even a lost job. It repeats in early 2020, so her exit may not occur on the first aspect. Also running in April is tr Neptune opposition her Jupiter which continues her banana-skin slide with high hopes being dented. 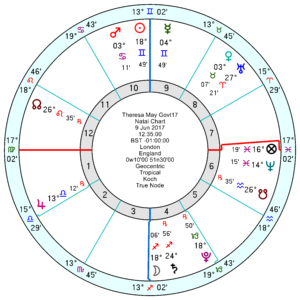 Her Term chart picks up tr Neptune square the Sun and Moon from May 2019 onwards, on and off into 2020, which will be even more limp and ineffectual than before. Interesting. The BBC is reporting that the Brexit vote will be on Jan 15th – so it looks like a defeat. Nobody seems to have any idea of Mrs May’s Plan B or what happens next.